Cut through the noise of digital advertising to increase the impact of your marketing efforts. Digital advertising isn't what it used to be. Response rates are decreasing, but costs aren’t. Marketing tactics are becoming more aggressive to achieve slimmer margins, and consumers are increasingly irritated by the abuse. And while direct mail is still a highly impactful channel, the targeting capabilities can’t match digital, and it’s not easy for brands to easily plug into their marketing stack. Combine the brains of programmatic digital data and processing with the brawn of direct mail as a response driver, while avoiding the pain points in each channel. 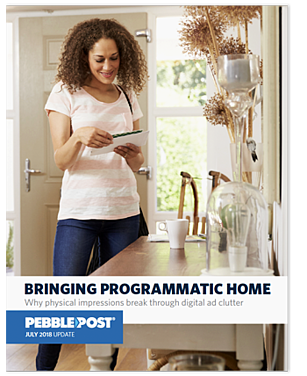 Download the free “Bringing Programmatic Home” white paper to get actionable techniques for improving ROAS and making an impact on your customers and shoppers.